In the context of a research on the Tunisian crisis, I studied the Tunisian activist blogosphere. Libération published this work on Saturday 12th February 2011. The Jasmine Revolution has been hailed as the Internet revolution. Through their connections with foreign networks, Tunisian bloggers have disseminated the events of the revolt in real time. Looking for the latest news, journalists and bloggers from around the world have been connected to blogs, Facebook and Twitter accounts of Slim Amamou (arrested under Ben Ali and now Minister of Youth and Sports of Tunisia) Lina Ben Mhenni (author of the blog “A Tunisian girl”) and many others. 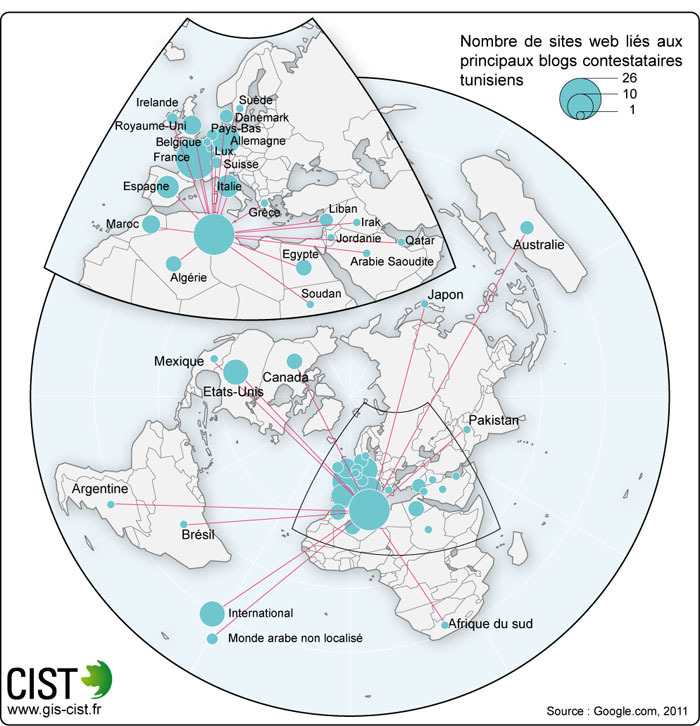 This map shows how foreign blogs are connected to networks of Tunisian bloggers. The analysis taked into consideration about fifteen Tunisian web pages (blogs, but also Twitter and Facebook) identified by the international press as the engines of the revolt. On the basis of the link tracing made by Google.com (last month), it was possible to reconstruct the links between these pages and the foreign blogs that have cited them. In addition to a major hub of internal links in Tunisia, a privileged connection with Europe emerges clearly: especially with France (25), but also Germany (12), Italy (8), Spain (8) and the United Kingdom (6). Significant relationships also exist with the United States and Canada. By analyzing these Western blogs, it is not surprising that more than half is managed by people from the Maghreb and they are often written in Arabic. Moreover, if we cross this media map with the Tunisian diaspora data, there are clear similarities. In 2008, according to consular statistics (Source: CARIM Migration Profile: Tunisia, 2010), 82.6% of Tunisians living abroad reside in Europe (54.6% in France, 13.4% in Italy and 7 8% in Germany). There is a weaker connection with Arab countries. Beyond a few links with Morocco, Algeria, Egypt and Lebanon, connections with sites in North Africa and Middle East are almost nonexistent. This is mainly due to the fact that the sites of activist Tunisian bloggers have often been censored in the rest of the Arab countries.